My name is Sinead and I am a 5ft 10, forty year old mother of two young children. Nearly four weeks ago I had the ExoVasc operation at the Royal Brompton Hospital in London. My family has a very strong family history on my Father’s side of thoracic aortic aneurysms and dissections. My Father had a successful operation in 2000, involving replacement of the ascending aorta, aortic valve and reimplementation of his coronary arteries. Since then my siblings and I have undergone regular echocardiograms and MRIs. I was found not to have definite Marfans Syndrome but testing concluded I have a Marfans habitus. 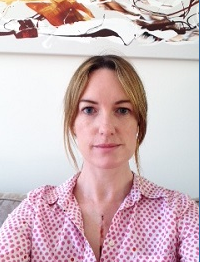 In June 2014, although my aortic root and ascending aorta did not reach more than 41 mm, my heart consultant at the Royal Berkshire Hospital felt that due to the significant family history I would be suitable for consideration for either an aortic root replacement or an aortic sleeve, ExoVasc, to protect against further dilatation. Having researched both options, the ExoVasc was easily my preferred option and after meeting Mr Rosendahl, my operation was booked for March 2015. My main concern prior to the operation was ensuring my two children, aged five and seven had childcare. Luckily I have amazing family and friends living nearby, without whom things would have been very difficult. I arrived at the hospital the day before my operation and my husband was booked to stay in the family accommodation for two nights, handily just round the corner from the hospital. The day of the operation arrived and I was given a sedative to keep me calm. I woke up in the AICU several hours afterwards and once the tube in my mouth was removed, my relieved husband was allowed to visit me. That night was very surreal as I drifted in and out of sleep, whilst being cared for by the amazing nurses. The next morning one of two chest drains was removed, which, whilst unpleasant, made moving easier. My catheter was also removed, leaving me with the remaining chest drain, and a neck drain. My progress was so good that I bypassed the HDU and went straight to the Ward where I spent a further four days before going home. It was a huge relief as the various drips and drains were removed, especially the one in my neck which was very heavy and sore. I was given a morphine clicker to help with the pain, but on the Saturday, two days after the operation, a nurse tried to get me to sit in a chair and said I was using the clicker too much. I found this very hard as I was sore and not very mobile. Once the clicker was removed, I found I was in a lot of pain and very breathless. I didn’t realise I was entitled to ask for morphine every four hours if required. Once another nurse told me that, I requested it when needed and my pain quickly subsided considerably. On the day I was ready to leave, I no longer needed morphine, just paracetamol and Ibuprofen. Prior to being discharged, the bandage covering my scar was removed. I was initially shocked as it was bigger than I expected, however I quickly got used to it. Since coming home progress was been steady and I was out walking the next day. The first few days I could not even cut my food and found eating tiring. I am tired and need a good sleep during the day, but my strength is coming back and my attention span is much improved. One thing I hadn’t expected was that my stomach was very bloated for some time after my operation and it took some time before I could fit back into my normal clothes. My two children have found it very hard that things are different at home, especially as they have been off on their Easter Holidays, but they understand I need to rest and every day things have become easier. It is three weeks since I came home now and I am pleased to say I walked three miles today with my mum and dog. My scar is healing nicely too. I still can’t do a lot of day to day things and the pain comes and goes but things are getting much easier every day. I am relieved the operation is now done and I no longer have the prospect of it hanging over me. I am certain my recovery would have been a lot longer and harder if the ExoVasc had not been an option for me and for that I am extremely grateful. Tal called me a couple of days after I returned home which was lovely and very supportive. I hope my experience helps inform others considering having the operation.